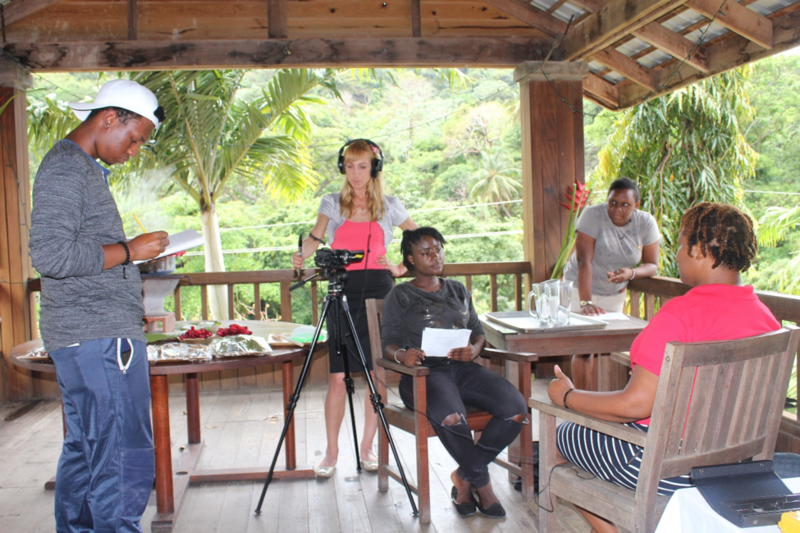 Cultural Entrepreneurship and Documentation Program in Grendada – It was wonderful to return to Grenada as senior faculty on the Cultural Entrepreneurship and Documentation Program. In many ways I knew what to expect this year, which is why I was so eager to return. The warm welcome started at the airport where we were met with big hugs from our Grenadian counterparts from TAMCC. The sweet smell, humid air and swaying palms also greeted us immediately. This year the focus of the oral history component of the program was traditional beverages and arts and crafts. After an interviewing tutorial, both the Canadians and the Grenadians were ready to hit to road. We crisscrossed the island on its rollercoaster hills, interviewing interesting people about these two areas of expertise. It was exciting to see how quickly the TAMCC students and NSCC students bonded. They were one team, not two, from the beginning. The second week saw the students gather together in the classroom to come up with entrepreneurial ideas that helped promote the unique culture of Grenada. The presentations were engaging and innovative, and the packed crowd seemed to be as impressed as I was. Once again the highlight of the program for me was to watch all the students grow as individuals over the short two-week experience. They gained confidence, learned about new cultures and made deep friendships. Is there a better kind of learning experience? If so, I’m not aware of it. And everything they accomplished in Grenada is helping preserve the heritage of this vibrant Caribbean country for future generations. This is truly a special program to be a part of and I’m grateful for the opportunity once again. I know I will continue to visit Grenada even though my role on the CEDP is now complete.